In this paper an attempt is made to discuss types of hydropower schemes and present a methodology on development and operation of Pico hydropower projects for running the generator and use of battery to light up the house are common to rural folks. The difficulty of getting the fuel and the cost of fuel are the main problems. Use of other alternative renewable energy such as solar photovoltaic modules, which is available for a number of hours per day, is very costly. It is required to find suitable option to provide cheap and reliable option. While large hydropower provides electrical power for industry and domestic use, small-scale hydro is making some contributions toward providing this basic need to remote and off-grid areas especially in developing countries. This paper is focusing on Pico hydro, a run-of-river application which does not require dam or reservoir for water storage. It is cost effective, environmentally friendly and the turbine can be manufactured locally. Several applications in developing countries are highlighted. Small-scale hydro turbines are reviewed and their applications at power production environment. This paper describes the design and development of Pico-hydro generation system using consuming water distributed to houses. Water flow in the domestic pipes has kinetic energy that potential to generate electricity for energy storage purposes in addition to the routine activities such as laundry, cook and bathe. The inherent water pressure and flow inside the pipe from utility’s main tank that used for those usual activities is also used to rotate small scale hydro turbine to drive a generator for electrical power generation. Hence, this project is conducted to develop a small scale hydro generation system using consuming water distributed to houses as an alternative electrical energy source for residential use. Pico hydro is hydro power with a maximum electrical output of five kilowatts (5kW). Hydro power systems of this size benefit in terms of cost and simplicity from different approaches in the design, planning and installation than those which are applied to larger hydro power. 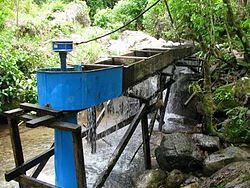 Recent innovations in Pico-hydro technology have made it an economic source of power even in many of the world’s poorest and most inaccessible areas. It is also a versatile power source. AC electricity can be produced enabling standard electrical appliances to be used. Common examples of devices which can be powered by Pico-hydro are light bulbs, radio and televisions. Normally, Pico-hydro power system is found at rural or hilly area . Figure shows an example of typical Pico hydro system applications at hilly area. This system will operate using upper water reservoir which is a few meter high from ground. From the reservoir, water flows downhill through the piping system. This downhill distance is called “head” and it allows the water to accelerate for prime moving system. Thus, the turbine will rotate the alternator to produce electricity. However, this research is conducted to show the potential of consuming water distributed to houses at town area as an alternative of renewable energy source. The water flow inside the pipelines has potential of kinetic energy to spin small scale generator turbine for electricity generation. Therefore, this project has been done to show the additional use of consuming water distributed to houses for electrical power generation instead of routine activities such as bathe, laundry and dish wash. The electricity can be generated at the same time those usual activities are done without extra charge on the water bill consumption. The main function of the system is to store the generated power by means of battery charging for future use particularly during electricity blackouts. The proposed system is expected has a maximum capacity of 10W which is very much less compared to other Pico-hydro power systems.